Other photos: Photo 1, Photo 5, Photo 2, Photo 3, Photo 4, Photo 6, Photo 7, Photo 8, Photo 9, Photo 10, Photo 11, Photo 12, Photo 13, Photo 14, Photo 15, Photo 16, Photo 17, Photo 18, Photo 19, Photo 20, Photo 21, Photo 22, Photo 23, Photo 24, Photo 25, Photo 26, Photo 27, Photo 28, Photo 29, Photo 30, Photo 31, Photo 32, Photo 33, Photo 34. This yacht represents a unique opportunity to own a low hour and immaculately maintained Ferretti 761 with a host of extras over and above the standard specification. There are only a very select few of these new generation Ferretti 761's available in the world today, particularly with this level of equipment. This Ferretti 761 is fully MCA compliant and has the larger 1522 HP MTU power option with just 1,800 running hours. With the optional twin crew cabin with bathroom to ensure separation of crew and guests and the 4 cabin layout this Ferretti 761 offers levels of comfort onboard that you would expect from much larger vessels. 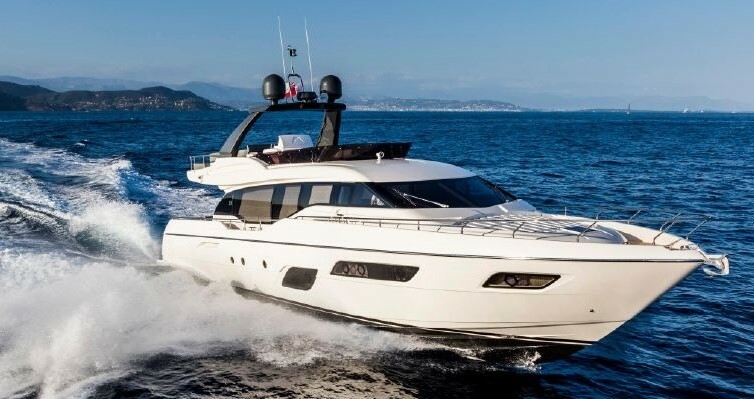 This Ferretti 761 has the Ferretti patented, sophisticated and expensive (approx. 200k EUR) Anti Roll Gyro (ARG) zero speed stabilizer system fitted offering unrivalled comfort to your guests when at anchor. With her full export documentation included for use outside the EEC, this Ferretti 761 is perfect for a buyer wishing to take her anywhere in the world. Please call our offices today to arrange a viewing of this Ferretti 761 (which can be done at short notice) or to make an offer today. Full and detailed specifications of this Ferretti 761 are available upon request. SYS Yacht Sales is pleased to assist you in the purchase of this vessel. This boat is centrally listed by Think Yachts.